Who she is: Denisia pens the blog, Polishing Colors. She’s into fashion, photography, karting, and colors. She also happens to be a social media enthusiast and muffin lover. Why we love her: We’re down with the way she jazzed up a simple shirtdress with a headscarf. Wrapping the printed silk into a bow injected the perfect dose of flamboyance into her look. Who she is: Lindsey calls herself a nomadic traveler who loves all things geek and Game of Thrones. She also has a soft spot for cute animals. Don’t forget to check out her site, Have Clothes, Will Travel. Why we love her: The ultra-feminine print-on-print ensemble she put together here sure deserves a thumbs up. Don’t you think? Who she is: Jocelyn of The Fox and Fern is a nature lover who enjoys rock climbing just as much as curling up with a good book. Judging from her website, the gal is quite fond of dressing up too. Why we love her: You can’t hate a girl who’s got a good-looking kimono on her shoulders. We love how she teamed the cover-up with a hat and kept it casual with flat sandals. Who she is: Dominique started her blog, Goldschnee, back in 2012. Since then, the 22-year old fashion and photography lover has gained quite a following. Besides blogging, she is currently studying at a university in Germany. Why we love her: We like the neutral palette of this outfit. It’s so easy on the eyes. Of course, the best part about the ensemble is the paisley printed wrap. It made her look even more elegant. Who she is: Alexandra studied fashion in Paris, and has been working in the fashion industry for 7 years now. Aside from calling the City of Lights her home during her stint in France, she has also spent time in Barcelona and London. Currently, she is based in Berlin working as a fashion stylist. Besides photography, writing for her blog occupies Alexandra’s free time. Why we love her: We can’t stop looking at her oversized wrap. It truly is the perfect throw-on for a day at the beach. 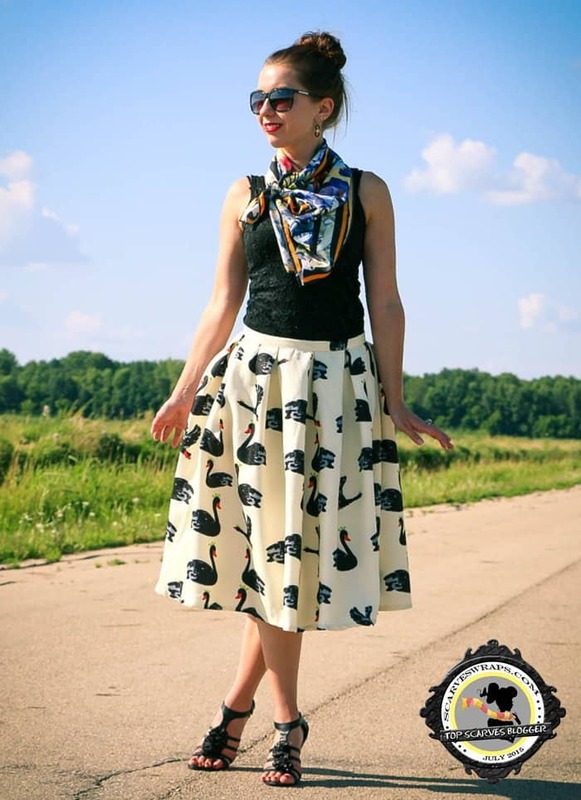 Who she is: Laura of Paper Mothball Vintage can do vintage fashion like no other. The model-turned-photographer-and-designer can literally look like someone straight off a vintage fashion magazine. Laura also happens to be an Anthropology graduate. She worked as a model for 10 years before venturing into blogging and photography. Why we love her: Honestly, we think her perfectly-styled head scarf pulled this whole look together. Would you agree? Who she is: Diana of Z Hours is a freelance features writer, contributing editor, stylist, and personal shopper. She is an English major graduate with a masters degree in Communications. She also happens to have a graduate degree in Fashion Merchandising. Yep, that’s a whole lot of accolades under her very stylish belt. Why we love her: We’re down with the pastel-pink-on-neutral palette she put together here. It’s so light and soothing to look at. Even more noteworthy are the accessories she used to go with. The hat, the scarf, and the shoes turned the simple sweater ensemble into a look that can only be labeled as chic. Who she is: Meng Li, whose nick is Coco, is originally from China. She moved to San Francisco to work as a designer and put up a blog called A Cup of Coco, where she could share self-described tomboy-feminine style. Why we love her: We’re loving the mix of texture and print in this getup. It’s elegant, tactile, and one of a kind. Who she is: Laura is not just passionate about clothes, she’s obsessed with shoes too! That much we can deduce from her blog, Living in a Shoe, and social media accounts. Why we love her: One word — glamorous. The look she put together here is truly so. Would you agree? We love how she jazzed up the tunic with a bright yellow scarf worn as a turban. It’s our favorite part of the outfit. Who she is: Lexi of Lex in Fleurs started blogging in 2013. She has an obsession with Hawaiian prints, and we’re guessing all kinds of flowers and flower prints too, judging from the name she used for the blog. Why we love her: Hats off to the gal for being bold enough to wear two doses of animal print. We also like how she managed to look fierce, boho, and edgy all at once with this getup.